The Maine Real Estate Sales agent Exam is split into two parts. The first part is the real estate Sales agent national exam and the second part is the real estate Sales agent state specific exam. 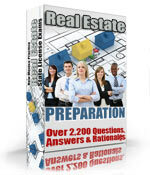 The national portion of the Maine Real Estate Sales agent exam is comprised of 80 questions. In order to pass the exam an examinee must answer 60 out of the 80 questions correct to pass (75% correct). The time limit allowed to complete the entire Maine Real Estate Sales agent exam is 3.5 hours. The state specific part of the Maine Real Estate Sales agent Exam is comprised of 45 questions and an examinee must answer 34 questions correct to pass (75% correct). The time limit allowed for the just the Maine Real Estate Sales agent state section is 1.5 hours. In Maine if you pass one part of the Real Estate Sales agent Exam but fail the other, you must retake and pass the part you failed before the expiration date on your authorization card. The Maine Real Estate Sales agent exams are taken by computer. The exam is closed book. You are permitted to bring a simple functioning calculator since 10% of the exam questions might involve math. Please remember to bring two forms of identification to the testing center. Also bring the confirmation number given to you when registering as well as your pink exam authorization card. Try to arrive to the exam site at least 30 minutes early, do not arrive to the exam site later than 15 minutes or you will not be admitted. The registration fee to take the Maine Real Estate Sales agent exam is 85 dollars.